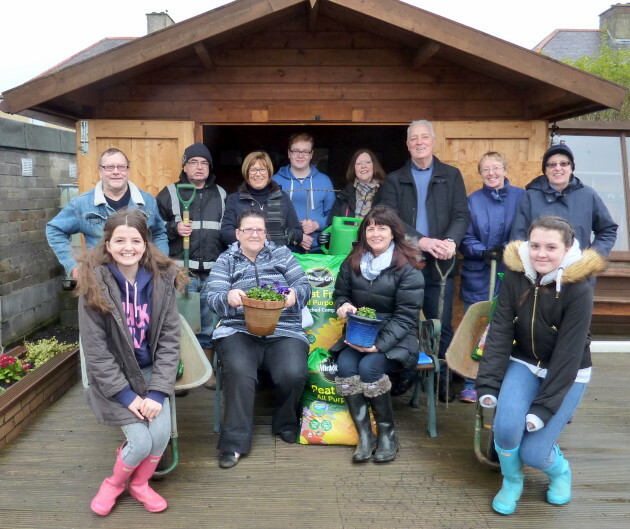 Chapelhall Allotments are set to grow into a big success story – thanks to funding provided by Scotmid Co-operative’s Community Grant programme. The allotments situated in Chapelhall, Airdrie, successfully applied for a grant and managed to buy 60 bags of compost with the funding, which will be used to grow vegetables and flowers. Chapelhall Allotments Treasurer Marion Dawson applauded the gesture and stresses the funding will help the community group to achieve their goals. Local community groups in Airdrie are being encouraged to follow suit and apply for a Community Grant from Scotmid, which has stores in Drumgelloch, Coatbridge and Holytown. Scotmid Co-operative’s West Regional Membership Co-ordinator Yvonne Goodfellow said: “We would actively encourage local community groups in the Airdrie area to apply for funding via the Community Grant programme. Image: (front row) Emilie Scott, Helen Hall (Chapelhall Allotments Secretary), Karen Scott (Scotmid Co-operative West Regional Committee), Ellie Scott. (Back row) Graham Docksey (Chapelhall Allotments Vice Chairman), Tommy Mackle, Mae McCartney, Ewan Speirs, Marion Dawson (Chapelhall Allotments Treasurer), Alex McCartney (Chapelhall Allotments Chairman), Anne Peock, Jean Peock.